Oooh!! La La… La La! As much as I adore nail polish in a myriad of crazy colours – in all my makeup, actually – I love to go back to nudes and soft colours once in a while. So when nail mail arrived in the form of Whimsical Ideas by Pam, which I had been patiently awaiting for weeks, I could not decide which to try first! You see, Pam no longer ships internationally so I had to get creative to order these beauties. And re-routing through the States takes a lot longer than I thought… 🙂 I was so excited, I briefly contemplated wearing all of them at the same time! Because I had been itching for all of these beauties since the day I discovered Pam (why didn’t I just order them then, right??? I know…), it really was a tough call, but I chose Ooh La La! Ooh La La! is a stunning, very sheer, bubble gum pink. Not bubblegum pink in a Katy Perry kind of way, but in a French manicure, elegant kind of way. Dispersed in the pink goodness there are tiny light blue micro glitters, along with lavender, small hex glitters. Ok enough reading… here are some pics! As you can see, Ooh La La! is very sheer. 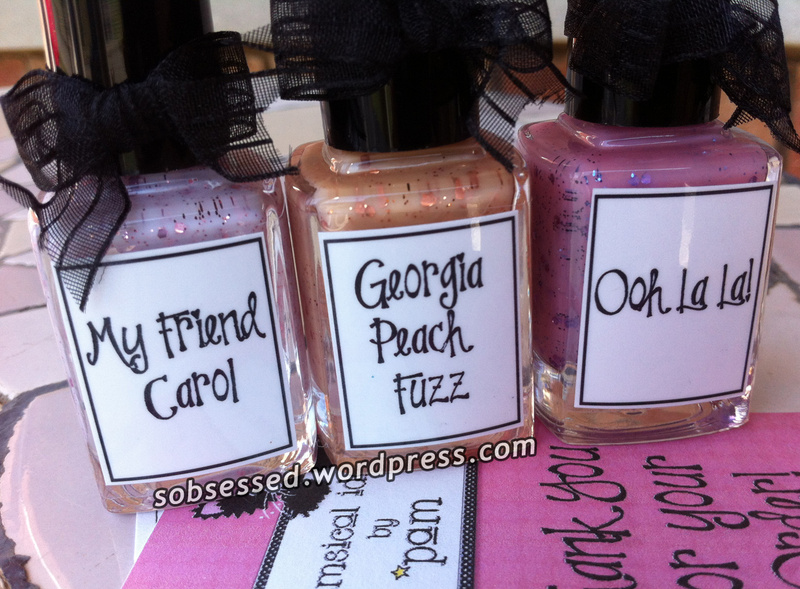 For these swatches, I wore Ooh La La! on its own (I always like to see what polishes look like without undies). I used a base coat of A England’s The Knight, followed by three coats of Ooh La La! and a top coat of China Glaze Fast Forward quick-dry top coat. I could probably have added a fourth coat but I don’t know how much of an impact that would have had on the opacity. I love this look. If I had painted my tips white, this would have been a gorgeous glitter French mani!